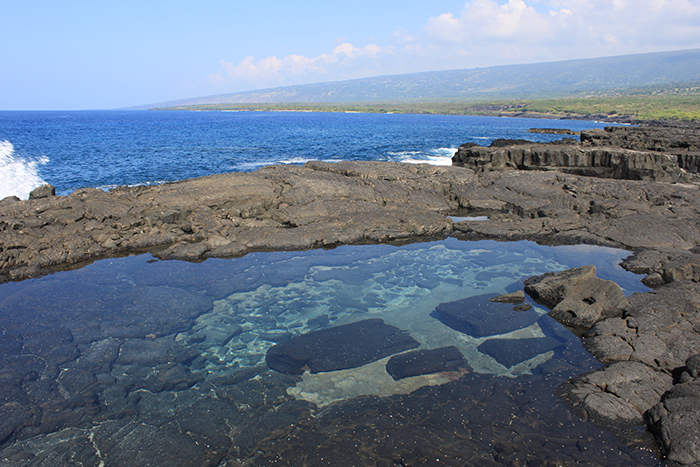 The remains of the ancient fishing village of Kauleoli lie just south of Pu‘uhonua o Honaunau National Historic Park on the Kona Coast of Hawai‘i Island. At 59 acres, the village site occupies the entire shoreline of the Kauleoli ahupua‘a (land division). A well-preserved section of the Ala Kahakai National Historic Trail traces the shoreline, rich with historic sites and artifacts, including house foundations of traditional Hawaiian drystack masonry, a canoe shed, heritage agriculture areas, and salt-making ponds. In August 2016, The Trust for Public Land—working with local families and the National Park Service—protected the heritage site as part of Ala Kahakai National Historic Trail. With the village protected, walkers can now access the ancient path from the fishing village of Ki‘ilae at the southern border of Pu‘uhonua O Hōnaunau National Historic Park. The Trust for Public Land helped add Ki‘ilae to the park in 2006. The protection of Kauleoli was made possible by funding from the federal Land and Water Conservation Fund and through the ongoing support of Trust for Public Land donors nationwide. *We apologize that this site does not support the kahako Hawaiian diacritical marking.